Harringtons Complete Dry Food for Adult Dogs is a premium quality food that provides wholesome nutrition to all dogs from 8 weeks onwards. 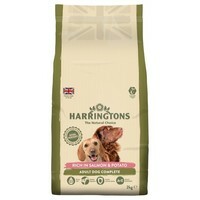 Containing Salmon as a source of protein and high-quality omega oils, Harringtons Complete has been made with completely natural ingredients and formulated to contain all of the vitamins and nutrients your dog needs. My GSD is suppose to be on a special diet food, but she has been on this food for 18 months and has been very good, she is 12yrs now and still loves this food. Thanks Harringtons & VetUK for selling it. I think this food was good for my Shepherd, although he went off this flavour after a while. His stools seem nice and solid and he's very lively and happy so I guess its doing its job for him.